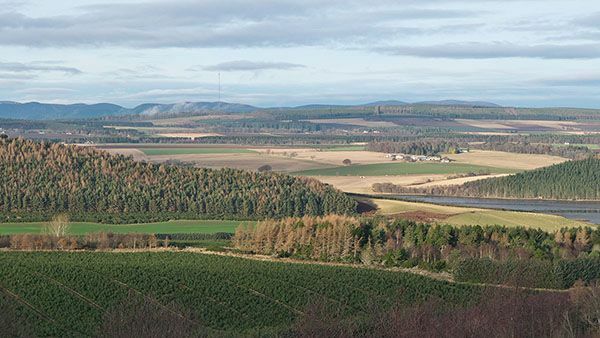 Despite its name, the Black Isle is not an island, but a peninsula, surrounded on three sides by water – the Cromarty Firth to the north, the Beauly Firth to the south, and the Moray Firth to the east with the Rivers Conon and Beauly marking its western edge. Long famous for its rich farmland and the annual Black Isle Show, it's now also well known as a great place to enjoy wildlife - from dolphins to deer, from osprey to otters, from seals to Scots Pine. It's also steeped in history, with castles, cairns and even a cathedral and three museums to enjoy. There are beautiful views - you can see Ben Nevis on a clear day - and a network of quiet roads and forest tracks. It's a wonderful place to explore, relax, unwind. The peninsula has much lovely woodland. Forestry Commission Scotland manage four sites here of "wildlife, woodland and water": the intriguing Munlochy Clootie Well , the wilder Monadh Mor on the west side, Culbokie Woods with its old pines and stunning views to Ben Wyvis, and Learnie Red Rocks for the mountain bikers. Elsewhere, wander under the old broadleaves on the Rosehaugh estate by Avoch or at Redcastle near Muir of Ord. The mix of woodland, water and farmland leads to the Black Isle being a great place for spotting flora and fauna: have a look at our Wildlife pages, grab your binoculars or your magnifying glass, and head on out. Come and discover the Black Isle! See here for a list of books on the history of the Black Isle in particular and of the Highlands in general. "Discovering the Black Isle" by Douglas Willis gives a great overview of the area, covering the geology which sparked Hugh Miller's pioneering research, the archaeological remains from cairns to castles, farming, woodlands, folklore, and recent changes with the construction of the Kessock and Cromarty bridges. Historic village at the northern tip of the Black Isle. Village at the bottom of the Fairy Glen. The Black Isle's largest town. Fishing village on the east coast of the Black Isle. Village at the head of Munlochy Bay, a big draw for birdwatchers. The first village on the Black Isle when you cross the Kessock Bridge. Historic town, a gateway to the Highlands. Home of the Black Isle show. Farming village with views to Ben Wyvis.